For better livestock production and productivity, it is essential to assess the genetic diversity of the food which is fed to livestock. One of the main food sources for livestock in East Africa is Napier grass. Trying to bring their research to wider audiences, scientists at the International Livestock Research Institute (ILRI) have used a poster to highlight the importance of enhancing the use of Napier grass in order to improve its future effect on small-scale livestock production. 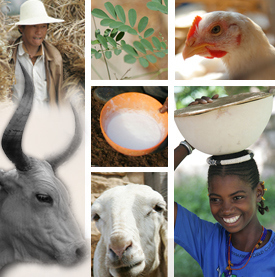 It underlines one of ILRI’s key ambitions—to improve forage efficacy in order to allow for more productive livestock, thus assuring the reduction of poverty in developing countries through the implementation of greater food security. Download the poster: Teressa, A., Jones, C., Hanson, J. and Jorge, A. 2016. Exploring genetic diversity of Napier grass for better livestock production and productivity. Poster. Addis Ababa, Ethiopia: ILRI.